On Sunday Mallory and I went up to the pass to do a couple of summer transects for the Cascade Wildlife Monitoring Project. We attempted two of the transects, but it was a bit tricky since the transects were set up in the winter and deep snow makes it a bit easier to travel in straight lines there. Anyway it was a satisfying outing. It started out with a miserable amount of mosquitoes, which I think just served to make the things after that portion of the day seem all the better. There were a bunch of highlights for me: Finding a spotted sandpiper's nest with 4 eggs in it (the bird spooked off the nest when I was only a couple feet away or I wouldn't have noticed it) Getting to within 15 feet or so to a big buck with large velvety antlers while I was walking through some willow thickets. Finding weasel tracks (which I've only seen once before despite the fact that western Washington is supposed to have one of the densest populations of weasels anywhere). On the plant end of things I found rattlesnake plantain (Goodyera oblongifolia), wild ginger (Asarum caudatum), and high bush cranberry (Viburnum sp.). 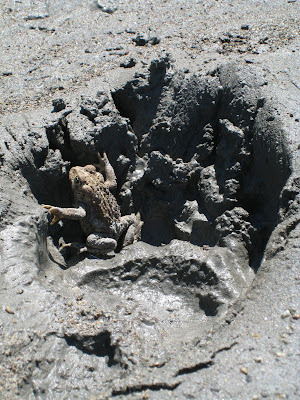 A western toad (Bufo boreas) in a black bear (Ursus americanus) track. I hung out on the middle fork of the Snoqualmie with some friends today. It was awesome. The water was still a bit cold, but I got sort of used to it and the sun was nice and warm when I got out. We mostly waded along side streams and the river with short forays in to the woods and walks along the beaches. There was also a time or two of swimming. Aside from the gorgeous weather it was an outstanding day for being a naturalist. Our animal species list totaled 42 and I'm sure we could have easily increased that with a bit more attention to birds and bugs (particularly if someone with more experience in those areas had been along), but what was the most exciting (for me anyway) was that we saw tracks/sign for 19 mammal species - there aren't many mammals that occur in the region with any regularity that we didn't get. Amongst the mammals was black bear and we saw tracks of a mother with two cute cubs. Well I can imagine they are cute anyway. Their tracks were cute. And based on size comparisons we think that we may have seen the tracks of 5 distinct black bear in that one little area. Another highlight was being able to stand in one place (without moving my feet) and pick a handful of ripe berries from four different native Rubus species - salmonberry, trailing blackberry, thimbleberry and black cap raspberry. I also discovered the most productive patch of trailing black berries I have ever seen, gathering a large handful and just denting the population. Usually when I find those ripe the quantities are quite limited.